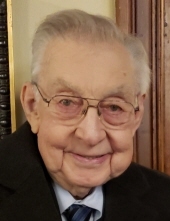 Eric Henry Gay, 84, of Whitehouse, OH, died March 27, 2019 at The University of Toledo Medical Center. He was born September 24, 1934 in Erie, PA to Robert & Catherine (Johnson) Gay. Eric graduated from Union City High School in 1952 and Grove City College in 1956. He served in the U.S. Airforce and was in flight training. He was a 1st Lieutenant in charge of the ground maintenance at Dover Airforce Base. Eric worked at Owens Corning as a Mechanical Engineer for over 25 years. Eric was a member of Hope United Methodist Church in Whitehouse, OH, Black Sheep RC Flying Club, Whitehouse American Legion, Progressive Fisherman’s Association and he was a 28-year member of AA. Survivors include his wife, Gabrielle (Hyre), daughters, Lynn (Jeff) Roedel and Lee (Matt) Zelina, son, Marc Gay, daughter-in-law, Santina Gay, grandchildren, Crystal, Megan, Eric, Evan, Fia, Neiva, and Roen, great grandchildren, Declan and Kellen, and brother, David (Ilona) Gay. He was preceded in death by his parents, wife, Mary Lou, son Matthew Gay and half-brother, Jack Gay. To send flowers or a remembrance gift to the family of Eric H. Gay, please visit our Tribute Store. "Email Address" would like to share the life celebration of Eric H. Gay. Click on the "link" to go to share a favorite memory or leave a condolence message for the family.